While aeronautics researchers across the globe continue to develop technologies that will make air travel more efficient, more sustainable and safer, there is a group of NASA researchers who are altering the long-held view that wings have to stick straight out from an aircraft and stay that way. Through NASA’s Convergent Aeronautics Solutions (CAS) Project, a team of engineers working within its Spanwise Adaptive Wing (SAW) project is investigating the feasibility of bending or shaping portions of an aircraft’s wings in-flight, potentially increasing performance and efficiency by reducing weight and drag. The ability to fold wings isn’t new. Since the dawn of ship-based aviation, U.S. Navy aircraft have been required to fold their wings for space conservation. Currently, this type of wing folding, or actuation, happens only on deck and serves no aerodynamic purpose. Other aircraft, like the XB-70, have folded their wings in flight with success. However, these fold systems required bulky, multipart structures, including hydraulics, pneumatics and electric motors, which weigh hundreds of pounds and take up valuable space. NASA’s engineers believe folding wings in-flight using advanced materials and technologies is a potential game-changer for future aircraft. The innovative actuation system that NASA and engineers from The Boeing Company are developing uses a revolutionary material that will accomplish this goal using less complex, lighter and more compact hardware than conventional systems. 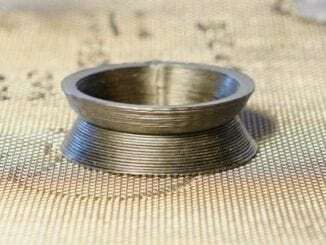 That material is shape memory alloy (SMA), an engineered nickel-titanium alloy that can be trained to return to a desired shape after deformation by applying heat. Much like folding a wing, SMA isn’t a new breakthrough. It is commercially available and its unique properties make it an attractive alternative to common actuators. However, current commercial SMAs have limited capabilities and can only be operated at or near room temperature. 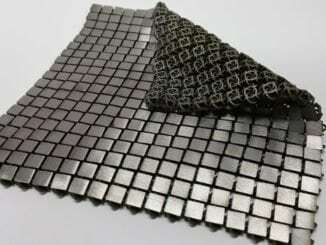 The material NASA is developing is similar to these alloys, but with increased capabilities, higher operational loads, higher operating temperatures and energy density. The material has more predictable properties and can be accurately controlled, making it well-suited for aeronautics applications. 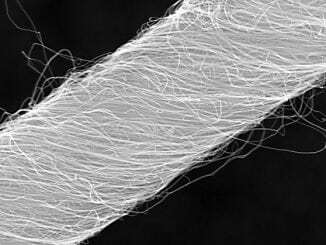 It is also unique in regards to memory or “training,” because the rare microstructural features produce a better, more stable material. For the SAW project, NASA is using SMA materials as torque-tube actuators. In this configuration, a single or group of trained SMA tubes are heated via internal heaters or external electrical coils, triggering them to twist and perform the desired actuation to drive a folding wing. Electrically-induced temperature change is only one possible stimuli. SMA can also be activated by using bleed air from the aircraft’s engines or simply through the ambient temperature changes experienced during flight. This compact, lightweight application, which is also extremely quiet, allows the entire actuator package to be attached at the wing hinge point. Conventional actuation approaches typically cannot fit in this area, leading to heavy and complex linkages or transmissions to drive a wing fold or similar aerodynamic surface. But going from the test bench to replacing proven systems with SMA will require the development of a complete actuation and control system, and this is where Boeing’s expertise and previous experience comes in. Being involved in NASA’s SAW project is just one of Boeing’s endeavors into wing shaping and SMA applications. Boeing previously used SMA as part of a flight test program in 2012, where it integrated a compact SMA torque tube actuator into a small trailing edge flap on a 737-800, one of Boeing’s ecoDemonstrator aircraft. 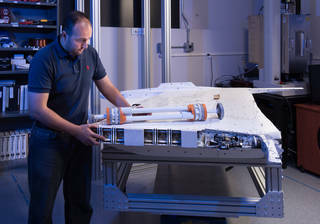 While NASA prepares to integrate SMA into SAW’s subscale flight-test of the Prototype-Technology Evaluation and Research Aircraft (PTERA) later this fall at NASA’s Armstrong Flight Research Center in Edwards, California, the team at NASA Glenn wants to get a head start on ground testing SMA actuators on a large-scale wing. To do this, NASA Armstrong removed a wing section from one of its F/A-18 scientific research aircraft for testing at NASA Glenn. 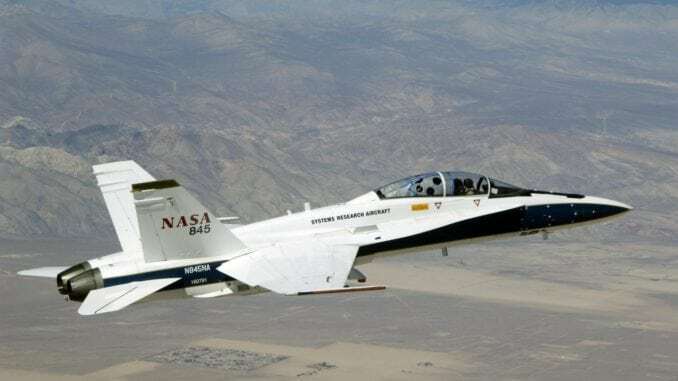 The F/A-18 was selected not only because of NASA’s access to the Boeing-built aircraft, but also for the wing-fold system required by the U.S. Navy. The wing section, which was delivered to NASA Glenn in July, will have all of the factory fold mechanics removed, and it will be retrofitted with a 20,000-inch-pound SMA torque-tube actuator. When activated, the wing actuators will heat up and twist to move the 300-pound section over a 180-degree sweep. That can be 90 degrees from the flight-ready position to the vertical folded position, as well as moving 90 degrees down. More importantly, NASA wants to demonstrate actuation to any position desired within that 180-degree sweep. Through the full-scale ground tests and the upcoming subscale flight test, the SAW project team is working to transform aircraft design through SMA-enhanced wing shaping. Ultimately, this shaping capability could increase aircraft performance during all phases of flight, including ground, subsonic and, possibly, supersonic. SAW is a collaboration between NASA, The Boeing Company and Area-I, and it is part of NASA’s CAS project under the agency’s Transformative Aeronautics Concepts Program.